Stoic stood Hifumi, awaiting the Vichy soldiers in his Hakama and Dougi. The byroads were blocked off, but he stood on the main—a road eight meters in width where a group could easily surround a man. Yet Hifumi stood in the middle of it. He expressed no caution; his eyes simply reflected the scene before him. Behold how many enemies have come! How many he could slay! This scene, this happiness, surely he could never have felt it were he still in Japan. 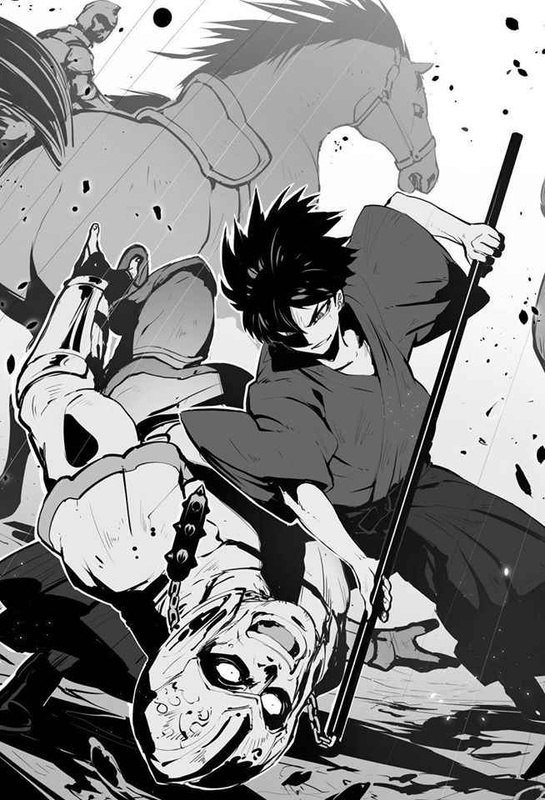 As the smile rose on his face, a katana rose in his hands; and with speed of lightning striking from the heavens, with the gentleness of a leaf carried by the wind, the katana was swung down. The enthusiastic vanguard blinked, unsure of what had happened, but by the time he blinked again he had already drowned in blood. For his face had split open. Again and again the sound of wind being cut was followed by shrieks. A step into his range, and the katana tip would reap your life. Slice open an artery where the armor was weak. Not once did the katana strike bone or armor. As mechanically as if doing work, as beautifully as if an artist, he repeatedly carved their bodies from every angle. Their captain barked out orders, and as if snapping out of a trance, the soldiers attacked Hifumi from both sides and the rear. And yet no one managed to wound him. A sword only cut air around him; a mace merely struck earth. Hifumi was quite surrounded: some desperately rushing to be killed, others already a corpse, and yet others soon to become a corpse. The road was dyed red: and to a friend it may even have looked beautiful. The captain angrily responded to his adjutant, who could not comprehend such a bizarre order. Curtly replying, the Adjutant offered a prayer and ordered the bowmen to fire. The arrows, much to the pride of their bowmen, flew tightly together. Without waiting for the result, the captain began issuing orders to the remaining soldiers. They were to dismantle the structures blocking the roads and attack the enemy from behind. He had thus sent a hundred men on this quest. Ordering the another volley of arrows, the captain was sure of his victory. A rain of arrows entered Hifumi’s view. Taking but a single step away, arrows landed around Hifumi. A few soldiers around him were hit, and wallowed in agony. Those who could still move he disposed of; those who were fatally injured he ignored. He decapitated those who were hit in the shoulder, and then noticed that the enemy’s commander was ordering his men to clear the roads. And after briefly cutting down a few more Vichy soldiers, Hifumi confirmed that a hundred men had gone off to clear the roads and smiled. Seeing Hifumi decapitate five more men, even the trained soldiers stopped motionless. Though he was drenched in their blood, he nonetheless pulled out a paper to wipe the blood from his katana, and, after doing so, sheathed it. Darkness spread from Hifumi’s shadow and swallowed the earth around him. Hifumi use his darkness magic to dispose of the corposes. Vichy soldiers were terrified, although it had no effect on them—you can’t store away a living thing. With Hifumi in the center of a sea of darkness, the myriad corpses sunk and disappeared. As if the battle had never happened. At some point the katana on Hifumi’s waist was replaced with a 130 cm long pole. They would probably resent him no matter how he killed him; the few soldiers who remained now had their heads smashed in. As before, they just kept on dying. But unlike before, Hifumi was slowly walking forward even as he continued to slay countless men. A second rain of arrows has come. Hifumi twisted the end of the pole, and a chain dangled out from within it. With all their men firing in unison, there far more arrows this time. And while Hifumi was deflecting the arrows with the chain and approaching the Vichy captain, distant screams reached his ears. Although the blockade was made of a durable material, if many people were to press on it, surely it would eventually fall. The same occurred, and many soldiers started heading towards the main. The first among them were the youngest, those unaccustomed to war. And after a few steps the ground beneath their feet disappeared only to reveal iron and wooden pikes. Unable to so much as scream their bodies were pierced, and those who fell on top of them rendered fatal their wounds. Those who screamed were those who fell on top of the young. This crafty trap was placed past every blockade, and the number of wounded and dead only increased. Even if they were to take another route, they would only fall prey to another trap. Surely the number of dead would only number in the dozens, but the objective was not to kill but to stop their advance. The soldiers who stopped before the traps were welcomed by a volley of spears flying towards them. The soldiers were close enough that the spears needed not arch in their path, and many were pierced as a result. Hifumi’s guard appeared from deep within the buildings, as they use the spear-thrower to slaughter Vichy men. There were few such spear-throwers, so those empty handed followed with bows and arrows. The roads were narrow, and Hifumi’s guards were far; they could leisurely snipe away at Vichy soldiers. Even more lives were quickly extinguished. As for the captain, with messengers coming at him to report of ever increasing casualties, and the sight of Hifumi approaching, caused him to lose any remaining composure. Without waiting for an order, the adjutant commanded all remaining troops to attack the approaching monster. Yet he could not expect many to gather. And wielding a bizarre staff with chains, a man continued to approach while creating more and more corpses behind him. The adjutant wanted to command the forces to retreat but then he glanced over the captain. Would this power-hungry man be able to approve of that decision? Withdrawing now would close the door on his career. But otherwise all would die. Should he withdraw troops even if it means being court-martialed? The adjutant hesitated. The weapon Hifumi wielded, is a traditional Japanese martial arts weapon from the staff-family: the Chigiriki (Promise Tree). Normally it is made of wood, but it had to be made of metal so as to withstand Hifumi’s strength. With its length coming up to his chest, this weapon which is also sometimes called the Chigirki (Chest-cutting Tree), has a chain attached to the end of it and a weight attached to the chain. It is like a Japanese chain flail. The weapon has its perks and demerits, and is rather hard to use; and although it’s not Hifumi’s specialty, the weapon does allow for a great variety of attacks if you were to mix in Jojutsu* while using it. * A form of martial art using a cane staff. For example, crushing somebody’s throat and then stepping on their chest so as to stop their heart; or breaking their jaw, forcing them on their knees in tears, and smashing in their heads. Leaving corpses even more deformed than when he was using a blade, Hifumi hastened his pace towards a gathering of soldiers. This massacre has yet to end. Scolding his man, the captain desperately asked anyone to kill Hifumi, but the adjutant only sighed. And after taking a few steps away from the captain, the adjutant called out to nearby soldiers and made preparations to leave Rhone. Captain in his haste did not notice it; but Hifumi did. The departure of thirty men created an opening. The captain never even had the chance to draw his blade. By the time he noticed he was abandoned, it was too late. With but a single word, Hifumi wrapped the chain around the captain’s neck and brought him down from the horse. Struggle the captain as he might, he could do naught until Hifumi’s finger pierce through his eye. When Hifumi withdrew his hand, the captain (corpse) looked rather amusing. Seeing their captain killed, the soldiers completely lost their will to fight, and began edging back. Of course, they would abandon the corpse. Fearing the smile on Hifumi’s face, the Vichy soldiers scattered like baby spiders before a predator. They abandoned their weapons and the wounded too. Hifumi calmly wandered the field, disposing of any wounded, while his guard was busy burying the bodies. Those who had recently joined his guard were throwing up with lifeless eyes, while those who had already worked with Hifumi meticulously continued their tasks. Origa and Alyssa, after issuing the troops orders, rushed over to Hifumi. After looking at his appearance, Hifumi’s face had a bitter smile on it as he wondered how he’d wash all the gore off. He continued to take deep breaths even as he put away the Chigiriki into his dark storage. The blood-stained main road soon welcomed a bloody sunset. Having witnessed these revelries in the guild, Kasha, who came there to get her quest reward, wandered into the moon-lit street. She left of her own free will; as an adventurer her life made an about turn and she was rather well off. She also sick of killing people, was satisfied with her life as a freewoman, dined in fancy and expensive restaurants, and even went out to buy herself a new weapon. Even so, she occasionally missed Origa. To her surprise, she rarely thought of Hifumi, but when she did, she would remember his face when he ordered a man to die for her revenge. When she returned to her room, she turned on the magic tool Hifumi gave her. Within the four-corners of her small inn room, she collapsed on the bed, feelings of loneliness overcoming her. That line only increased her despair. Perhaps she was mistaken. Perhaps she should have stayed with Hifumi and Origa. Or, perhaps she should have forced Origa to come with her, even if by force. As many thoughts and regrets filled her mind, she heard someone knock on the door. She grabbed a sword and asked. In response, she heard a familiar feminine voice. In response to being let in, Pajo flashed an elegant smile. As there were no chairs, they sat on the bed and spoke without looking each other in the eyes. Wouldn’t it be better to make a request of the guild, she asked, but Pajo only smiled. Without any reservation, Pajo made a single request of her. Kasha was silent, and merely blankly stared at Pajo. The smile on her face has long turned serious, and cold, gold eyes stared straight at Kasha. What?! No, Clown revive! *uses revive* nothing happens… Oh! It’s because clown is not dead… *BAM* *uses revive* there you go much better! Jokes aside, thanks for the hard work! I personally don’t mind which. Both are nice in their own ways, but I can’t say I like her half-assed attitude, so perhaps I prefer her dying. Or just not showing up anymore. Oh, but this Pajou, she’s surely as good as dead already. Here comes her biggest mistake..